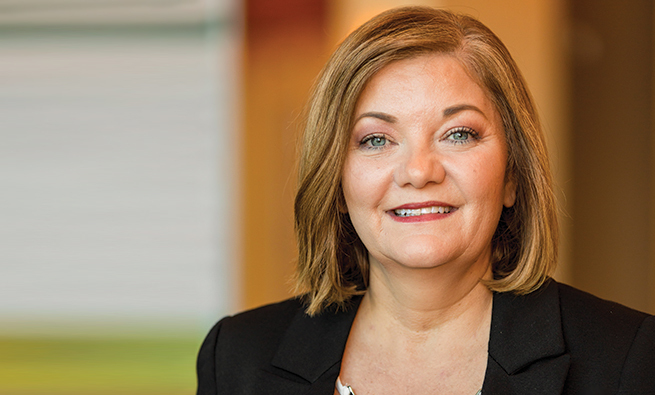 Growing up in rural Indiana, Ginger White, CMA, CSCA, never dreamed of becoming a successful corporate executive or leading a global organization like IMA® (Institute of Management Accountants). But that’s exactly what happened, thanks in large part to her determination and the encouragement from those around her. “I know I’ve been given opportunities, and I have a passion for sharing that hope and desire to succeed with others,” she explains. She’s been with the same company more than 20 years and has lived in the same state most of her life (with the exception of attending college in Kentucky and working in Missouri between her junior and senior years). That sense of commitment and gratitude will infuse her term as IMA Chair for the 2018-2019 fiscal year as she pursues initiatives that will help define IMA’s second century. Ginger was born and raised in Scottsburg, Ind., a tiny town “out in the middle of nowhere,” about 30 miles north of Louisville, Ky., with a population of about 2,500 when she was growing up (now it’s about 3,500). She’s the youngest of three siblings (she has two older brothers), and her close-knit family has always been active in their faith. “We were in church all the time,” she recalls. “Sunday morning, Sunday night, and Wednesday night—we would never consider missing it.” Music was an important part of this experience, as both her parents played instruments for the church (mandolin and guitar), and Ginger participated by singing with her mother in music ministry as well. 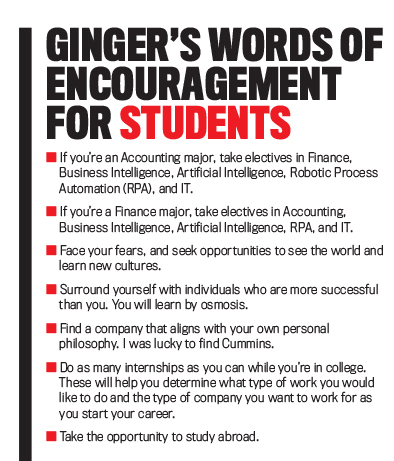 In high school, Ginger especially enjoyed Algebra I and Algebra II—something she’s found is an accurate barometer of interest in accounting. “Most accountants I talk to say they loved algebra. I’ve only met one accountant who told me they didn’t like it—and that immediately made me concerned for her career choice!” she laughs. While in high school, Ginger worked at McDonald’s—taking orders, flipping burgers, and shaking fries. It was mostly out of necessity: She wanted her own car, and, while her family was willing to pay for the insurance, Ginger needed to make the car payment. The experience gave her a strong work ethic, and when she graduated high school she headed directly into a full-time job. “I really didn’t think a four-year college was an option, and my family wasn’t hugely supportive of the idea.” Instead, she enrolled in nearby Ivy Tech Community College to earn a legal secretary technical certificate while working at a local department store, McCrory’s. She was assigned to the customer service desk, which helped strengthen her problem-solving skills, not to mention her ability to work with people (and money). After a year at McCrory’s, Ginger found her first “real job”—as a secretary at Robus Leather Corp., a manufacturing company. In six months, she was promoted to the customer service department, again giving her an opportunity to apply her can-do attitude. It took Ginger three years at Robus to come to an important realization: She was never going to be promoted to sales manager or supervisor without going to college. She knew she needed a bachelor’s degree, and she was fortunate to learn about an opportunity to study at Berea College in nearby Kentucky. Ginger was able to graduate without student debt. And having earned her bachelor’s degree in business administration and management, she taught Accounting I two nights a week at the technical college she once attended while also working full-time during the day. She enjoyed the work, so she decided to become a full-time teacher. There was a snag, however: A master’s degree was required because of new accreditation changes. Solving that problem was simple, thanks to advice she got from her future husband, Scott, who was working at Cummins at the time: He suggested she join Cummins, too. So she did. 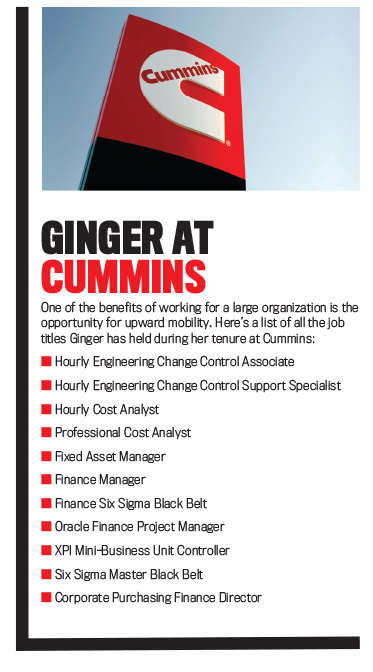 Ginger’s two-decade career at Cummins began modestly enough: She took a job as an hourly employee, making $8 an hour. Why Cummins—the Columbus, Ind.-based company and a global leader that designs, manufactures, sells, and services diesel and alternative fuel engines; electrical generator sets; and related components and technology? She heard that employees could pursue their MBA degree, paid for by the company, while working there. What followed was more than 20 years of moving steadily up the ranks at Cummins, assuming roles of increasing responsibility. Ginger spent two years in a couple of hourly jobs before she secured her first exempt position in July 1999 as a cost analyst. She also took advantage of the program to attend Indiana University Southeast, where she earned her MBA in 2002 (as well as a second master’s degree in strategic finance in 2006). Needless to say, Ginger never became a full-time teacher at Ivy Tech. While progressing at Cummins, Ginger worked mostly at various sites in Columbus, except for brief stints in Nashville, Tenn., and Seymour, Ind. Her job titles included cost analyst; fixed asset manager (one year); industrial finance manager (two years); finance systems project manager (one year); controller of Xtreme Pressure Injection (XPI), a Cummins/Scania joint venture (three years); engine business finance Six Sigma Black Belt (two years); and, later, Six Sigma Master Black Belt (four years). Eventually she became corporate purchasing finance director, a position she’s held since 2015. Along the way, Ginger not only earned two master’s degrees but also gained expertise in Six Sigma, a set of techniques and tools for process improvement introduced by Motorola engineer Bill Smith. Ginger’s Six Sigma journey began in 2005 when she completed seven projects in two years and became Six Sigma Black Belt certified. In 2011, when she took a Six Sigma Master Black Belt role, she taught others Six Sigma and coached and mentored Green Belts and Black Belts at the company. In 2014, she directed a global initiative involving all business units, functions, and area business offices for Cummins’s leadership team. This initiative created a five-year road map to determine which critical processes by function should be common globally, as well as who should be responsible, accountable, informed, and consulted for each process from the function, business unit, or area business office. It was a huge undertaking. There were 28 functions in total, and each had three to five global critical processes that required a global process owner. It didn’t take long for Ginger to become acquainted with IMA after joining Cummins. 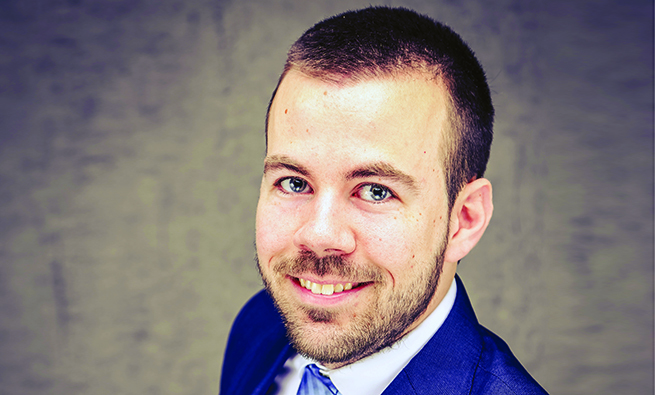 The company has supported the association and the CMA® (Certified Management Accountant) certification among its finance and accounting staff for many years. 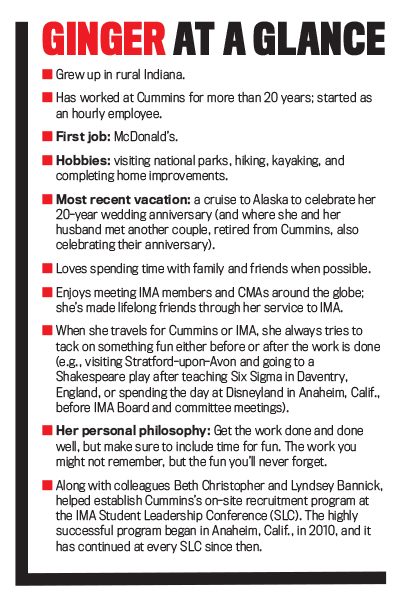 Ginger became an IMA member in 1999, two years after starting her work at Cummins, and took on leadership roles in her local chapter and council almost by accident. “I was just a young, regular member, but Ron Luther approached me and asked if I’d consider being the student representative for the Lincoln Trail Regional Council,” she recalls. “He told me I could go to that year’s Annual Conference & Exposition in San Diego with all my expenses paid. That was a pretty good offer, so I said yes.” Ginger eventually also served as chair of the Council’s student committee, as regional vice president, and as Council president. Ginger later learned that among the responsibilities of serving as the Council’s student representative was serving on her local chapter (South Central Indiana) board of directors. Embracing this role, Ginger became the chapter’s member acquisition director for the 2001-2002 fiscal year. She also served in other chapter roles and was elected chapter president for 2004-2005. Next came leadership roles as part of the IMA Global Board of Directors, where she served two terms as chair of the Member Relations Committee, chair of the Performance Oversight and Audit Committee, member of the Nominating Committee, and member of the Governance Committee. As IMA Chair-Elect in the 2017-2018 fiscal year, Ginger chaired both the Planning and Development and the Nominating Committees. For her many years of service, in 2014 Ginger received the IMA Exemplary Leadership Award. Despite her constant and thorough involvement with IMA for nearly two decades, Ginger’s pursuit of her CMA came only recently—and for a very specific reason. She had been working in various positions in quality and project management at Cummins, and she wanted to move back into a more accounting-related role (the one she has now). “I thought that earning the CMA would be a perfect way to help me transition back into accounting and finance,” she notes. She took Part 1 of the CMA exam in February 2014 and Part 2 in October 2014. She recalls the exact dates when she learned she had passed each part: April 11, 2014, and December 18, 2014. “I remember the exact dates because passing meant so much to me,” she acknowledges. Last October, she took her commitment one step further by being part of the inaugural class of those earning IMA’s new CSCA® (Certified in Strategy and Competitive Analysis) credential. Honored and eager to serve at the highest level of IMA volunteer leadership, Ginger plans to pursue five key initiatives during her three-year term as Chair-Elect, Chair, and Chair-Emeritus. First, she’s especially committed to students. “We have more than 29,000 student members right now, and we need to find a way to convert them into full-time members.” Her passion for students comes from her own experience and her appreciation of the opportunities that were offered to her. “I want to help encourage the younger generation—to give them access to things they may think are impossible,” she says. Second, she is encouraging excellence among women. She’s been actively involved in several Women’s Accounting Leadership Series experiences, most recently serving as a panelist for the event held this past March in Amsterdam. She’s especially eager to help identify and recruit more women to serve on corporate boards, the place where real change often happens. Currently, she is assembling a task force of women who would be able to participate. Third, she wants to help members through times of transition, paying attention to what she calls the “member life cycle”—providing services and programs for those in between jobs or careers and trying to decide what their next move should be, as well as for students as they transition into their first professional role. Fifth, she wants to find ways to provide continuing professional education to other regions outside the U.S., where it’s often difficult for people to attend live events in their time zone. 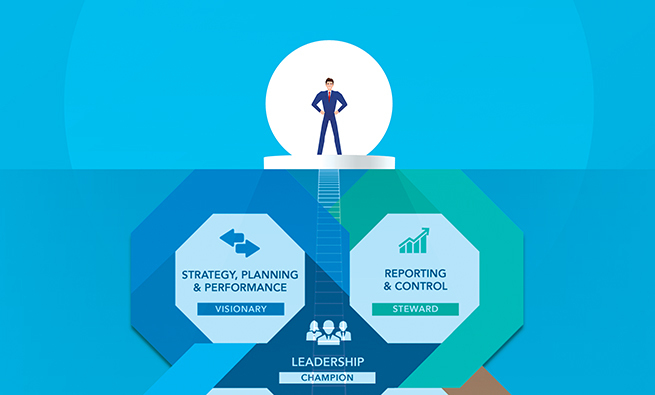 Developed by a Motorola engineer in 1986, Six Sigma is a method that provides organizations with tools to improve the capability of their business processes. The term Six Sigma refers to a scenario in which 99.99966% of all opportunities to produce some feature of a part are statistically expected to be free of defects (3.4 defective features per million opportunities). Jack Welch popularized the methodology when he made it central to General Electric’s business strategy in the 1990s. Use of teams that are assigned well-defined projects that have direct impact on an organization’s bottom line. Training in “statistical thinking” at all levels and providing key people with extensive training in advanced statistics and project management. These key people are designated Black Belts. Emphasis on the DMAIC approach to solving problems: define, measure, analyze, improve, and control. By reducing the aggregate number of defects, Six Sigma aims to improve productivity, employee morale, and the overall quality of products and services. At the request of Cummins’s executive director of tax, Ginger led an IRS interest assessment calculation project in 2006 as a Black Belt. It included team members from the Cummins tax department and the IRS. Using Determine Modeling, Inc. software, which required minimal annual cost, the company reduced the reconciliation time with the IRS from two weeks to one hour—and with no defects in the computations. The company’s executive director and tax director used the new software on other future projects, leading to significant incremental savings for Cummins. Knowledgeable and interesting read, nicely articulated in the brief Ginger White long journey by laying emphases on her skills, knowledge and experience. Motivational and inspiring one! This arTicle was perfect for me at this very moment. 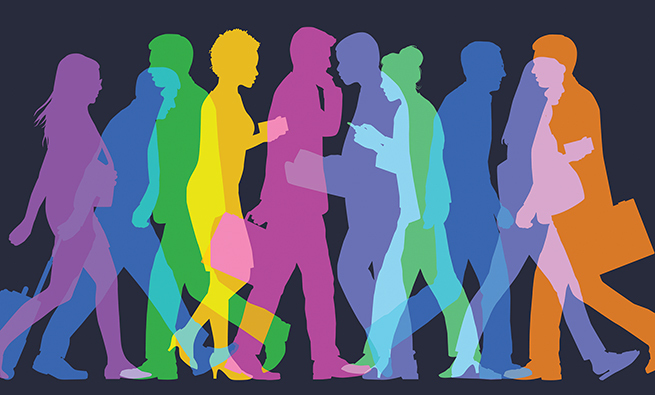 I am at a piVotal point in my career and this article could not have come at a better time. Thank you! so awesome thoughts and insights that Ginger has presented here. I appreciate the way she did her hard work and created the success! !